For those of us who’ve been waiting—far too long, it seems—for a smaller, lighter laptop from Apple, Tuesday’s announcement of the MacBook Air was a welcome one. I, for one, have been wanting a smaller version of the MacBook Pro since…well, since the MacBook Pro replaced the PowerBook G4 line, sans the 12-inch model. 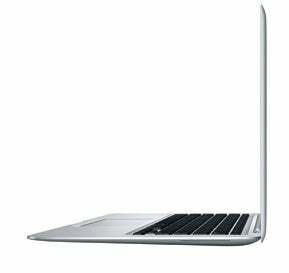 Before getting to those tradeoffs, consider the areas in which the MacBook Air stands out. Unlike many subnotebooks, it includes a generously-sized 13.3-inch, 1280- by 800-pixel, glossy LED screen, using the same LED technology found in the MacBook Pro. You also get a full-size keyboard nearly identical to the one found on the MacBook. In this respect, the MacBook Air is just as usable as a MacBook for general computing, which is to say much more usable than a typical subnotebook. Of course, because of these full-size components, the MacBook Air’s footprint is considerably larger than that of many subnotebooks on the market; in fact, the Air’s 12.8-inch width and 8.94-inch depth are each 0.02 inches longer than the corresponding dimensions of the MacBook. It’s in weight and thickness—or, if you will, thinness—that the MacBook Air shines. Whereas the MacBook and MacBook Pro are each around 1 inch thick, the MacBook Air is essentially three-quarters of an inch thick at the thickest point, and less than a fifth of an inch thick at the thinnest. And at only 3 pounds, the Air is 2 pounds lighter than the next-lightest Apple notebook. Other impressive features include the Air’s battery life (according to Apple, five hours with WiFi and Bluetooth active); a built-in iSight camera and microphone; video output that supports extended desktop with an external display; an ambient light sensor and backlit keyboard; and a large, multi-touch trackpad. But to squeeze into such a svelte package, the MacBook Air is missing a number of features, and other features are scaled back. The most obvious omission—one common to subnotebooks—is an optical drive. If you want to install new software, rip CDs to iTunes, watch DVDs, or burn data to disc, you need to either purchase the $99 Apple MacBook Air SuperDrive, which connects via USB, or use the new Remote Disk feature to “borrow” the optical drive of another computer on your network. Thanks to heat and space concerns, the Air also isn’t as speedy as its larger siblings. Instead of the 2.0GHz to 2.4GHz processors available in the current MacBook and MacBook Pro models, the MacBook Air comes standard with a 1.6GHz Core 2 Duo or, for $300 more, a 1.8GHz chip. (During his keynote on Tuesday, Jobs said that Intel had to create a new, smaller version of the Core 2 Duo to fit inside the MacBook Air.) To be fair, the Air’s processors are near the middle of the pack for subnotebooks, which range in speed from roughly 1.2GHz to 2.2GHz. Space and heat issues also limit the MacBook Air’s storage options. Because the laptop is so thin, it appears that only single-platter, 1.8-inch hard drives—the same type found in the 80GB iPod classic—fit; even a dual-platter, 1.8-inch drive, like the one used in the 160GB iPod classic, is too thick. These drives are also slower than a typical laptop drive, at 4200rpm compared to 5400rpm, and are ATA rather than the now-common SATA. The only alternative here, performance-wise, is the optional 64GB solid-state drive, although the high prices for such drives adds $999 to your tab; it’s likely to be another year or two before such drives are inexpensive enough to be standard features. Perhaps the most controversial compromise Apple has made will turn out to be that, unlike nearly every other subnotebook, the MacBook Air uses an integrated battery that can’t be easily removed. The apparent reason for such a design is that, as with the iPhone and iPod, the battery had to be shaped to fit within the Air’s unusually-thin profile; making the battery removable would have added considerable thickness, as the enclosure would have had to be redesigned to accommodate a more-traditional battery compartment. Finally, the MacBook Air adheres to the general rule that you pay more for smaller size. Even though it isn’t as full-featured as the MacBook, it costs $300 to $700 more than Apple’s consumer-level notebook, and for only $200 more you can get a much more capable—but larger and heavier—Mac Book Pro. Which raises the obvious question: Who, exactly, is this product for? Over the past couple days, I’ve heard quite a bit of criticism of the MacBook Air for its limitations. But I think many of these criticisms miss the larger goal of Apple’s latest laptop: Unlike the MacBook and MacBook Pro, the Air isn’t designed to be a general-purpose computer; it has, by design, limitations that will be unacceptable for many people. But for a particular market—people who value light weight and are willing to give up other features to get it—it’s an interesting machine. And if you’ve already got another Mac at home, the MacBook Air may be an appealing on-the-go complement, with many of its limitations able to be overcome through the use of clever software features such as Remote Disk and Back To My Mac. As for me, although it’s not exactly what I was hoping for, it’s close enough that I’m considering buying one to replace my aging—and heavy—original MacBook Pro. I’m also impressed by the MacBook Air for what it stands for: After years of Apple keeping its product line lean and tightly focused, the Air shows that the company feels its market is big enough to expand into niche products. In that respect, even if the MacBook Air isn’t for you—and I suspect that will be the case for most people—it’s something all Mac users should welcome.